Rent a gemstone mining station for your next elementary school or company picnic event. Fun and educational at the same time - your guests will love panning for gems, fossils, or shark teeth, and then taking them home. 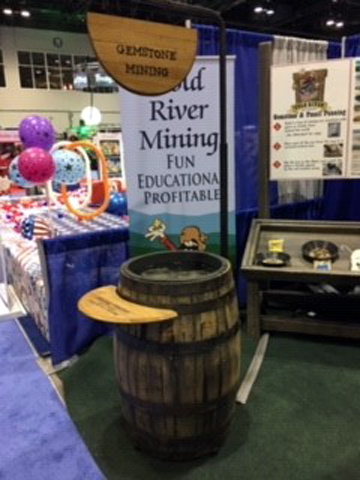 Bring a fun and education element to your next event. Choose from emeratds, large gemstones, fossils, shark teeth, or sea shell bags, to see what you can find. After panning, guests can match up their findings with an informatoinal card, to take home and learn more! Great for any company picnic, childrens birthday party, elementary school carnival, or beach theme event. Includes: Sluice, 2 panning sifters, pans with sample findings, bags and informational fact sheets, and attendant. Requires 6' x 6' space for sluice, plus space for table for bag distribution, and electricity (120 volt, 15 amps), approx. 40 gallons of water.